If you have excellent credit and you’re looking for a business card that offers easy-to-use benefits, the Capital One® Spark® Cash for Business credit card is worth your notice. The card offers unlimited 2% cash back on all purchases. Depending on the scale of your purchasing, that could add up to a serious chunk of change. With the Capital One® Spark® Cash for Business card, what you see is what you get. There are no rotating categories to keep track of like there are with some cash-back cards. There is no cap on the amount of money you can earn with the card, and you can add your employees as users at no extra charge. That means you and your cardholding employees can all earn 2% cash back on your purchases. The card’s APR is 19.24% Variable – not bad considering many cards offer APRs north of 20%. You will, however, have to pay an annual fee of $95 after your first year as a cardholder. To sweeten the deal, Capital One® offers a one-time $500 bonus when you spend $4,500 on purchases within your first three months as an accountholder. That’s enough to cover more than eight years of that $95 annual fee, so it’s worth hitting that $4,500 target if you can afford it and need to spend that much in your first three months with the card. Unlimited 2% cash back – You and any other cardholders you add to the account will earn 2% cash back on all your purchases, with no limit on your earnings. There is no minimum amount you can redeem, so you won’t have to wait to claim your cash back. Free employee cards – If you want to add employees to your account you can do so at no additional cost to you. All cards on the account are eligible to earn cash back from their purchases. Smart Tip: If you add employee cards, it’s a good idea to keep an eye on total spending on the account and make sure your credit utilization ratio (the ratio of what you spend to your credit line) doesn’t exceed the recommended 30%. Quarterly and year-end summaries – All of Capital One®’s Spark® Business credit cards come with customized, itemized reports of your spending at the end of each quarter and year to help you budget and make tax time a breeze. Customers who stand to gain from this card are those with excellent credit in search of a business credit card that offers a competitive cash-back rate with no fuss. Capital One® offers a slider on the website for the card. The slider will tell you how much cash back you’ll get each year based on your average monthly spend, but it’s easy to do the math yourself because of the flat 2% rewards rate. If you’re in the market for a balance transfer card, the Capital One® Spark® Cash for Business card may not be the right choice. Unlike with some cards, there is no introductory 0% APR that would make a balance transfer an attractive option. Another downside to the Capital One® Spark® Cash for Business card is that there’s a variable penalty APR of 31.65%. If you’ve had a problem making on-time payments in the past you may be better off with a card that doesn’t charge a penalty APR for late payments. The Capital One® Spark® Cash for Business card isn’t a card that requires a lot of effort on the part of the consumer. With every purchase you make you’ll earn 2% cash back. There’s no maximum amount you can earn, and no minimum amount you can redeem. If you spend at least $4,500 in your first three months after opening an account you’ll earn a $500 bonus. Once you hit the spending target and qualify for the bonus, Capital One® will apply the bonus to your rewards balance within two billing cycles. The Capital One® Spark® Cash for Business card has a variable purchase APR of N/A. That same APR will apply to any balances you transfer to the card. The card carries a variable cash advance APR of 25.24% Variable. There is a cash advance fee of either $10 or 3% of the amount of each cash advance, whichever is greater. There is also a variable penalty APR of 31.65% and a late payment fee of up to $39. The biggest catches associated with the Capital One® Spark® Cash for Business card are the $95 annual fee (which kicks in after the first year) and the penalty APR of 31.65% Variable. However, the latter is only a problem if you miss a payment. And if you spend $2,950 each year, you’ll get more in cash back rewards than you pay in the annual fee. If you currently have a Capital One® card or you had one previously you may not be eligible for the $500 one-time bonus associated with the card. You can call Capital One® to ask whether you would qualify for the bonus if you’re concerned about your eligibility. 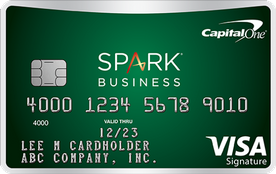 Every time you swipe your Capital One® Spark® Cash for Business card you will earn 2% in cash back. Your rewards can be redeemed whenever you want and there is no minimum or maximum you can redeem in one go. The APR on any balances you transfer to the card will be subject to a 19.24% Variable APR, the same as the purchase APR. There are no balance transfer fees, however the APR is high for a balance transfer. Many cards offer a 0% introductory APR on balance transfers to those who need to pay down a balance from one or more previous cards. Your purchase APR on the card will be a rate of 19.24% Variable. Any balances you transfer to the card will be subject to a variable APR of 19.24%. The APR for cash advances is a variable 25.24% Variable. 31.65% Variable. This penalty APR may be applied to your account if you make a late payment. Your due date is at least 25 days after the close of each billing period. If you pay your entire balance by each month’s due date you will not accrue interest charges. Cash Advance Either $10 or 3% of the amount of each transaction, whichever is greater. How does the Capital One® Spark® Cash for Business card fare when you compare it to competitor cards? The 2% cash back rate is competitive with what you would get from well-reviewed cards like the Citi® Double Cash Card. However, the Citi® Double Cash Card doesn’t charge an annual fee, whereas the Capital One® Spark® Cash for Business card charges a $95 annual fee after the first year. In general, though, 2% is considered a good rate for a cash-back card. If you’re averse to annual fees and/or you don’t have excellent credit, consider the Capital One® Spark® Classic for Business. The card offers 1% cash back on all purchases for no annual fee and is available to consumers with average credit. If you have excellent credit and want a user-friendly cash-back card for yourself and your employees, the Capital One® Spark® Cash for Business card is worth a look. The $500 bonus if you spend $4,500 in the first three months is a nice perk that will help defray the $95 annual fee you’ll owe after your first year as a cardholder.